When I first met my husband, almost 5 years ago, he told me all about his favorite country in the world: Costa Rica. Between high school ending and college beginning, he had spent 6 weeks in Costa Rica teaching English in a small village. He lived with locals and on the weekends traveled to unreal beaches and hiked around active volcanoes. Needless to say, he has been urging me (aka telling me every chance he gets) that I should go to Costa Rica. I finally bit the bullet and scored a great deal to Costa Rica thanks to my favorite email subscription service; Scott’s Cheap Flights. Most of my trips are spur of the moment because of his emails and I have saved so much money. Read more about Scott’s cheap flights here (Coming Soon). I have been excited for trips before, but this time I was excited and nervous. Matt was so pumped for me to go to Costa Rica, I didn’t want the country to let him down. For this trip, I really wanted to get a feel for what makes Costa Rica so famous – its nature and wildlife. I set up stays in hotels all around Costa Rica that are the leaders in eco-tourism. 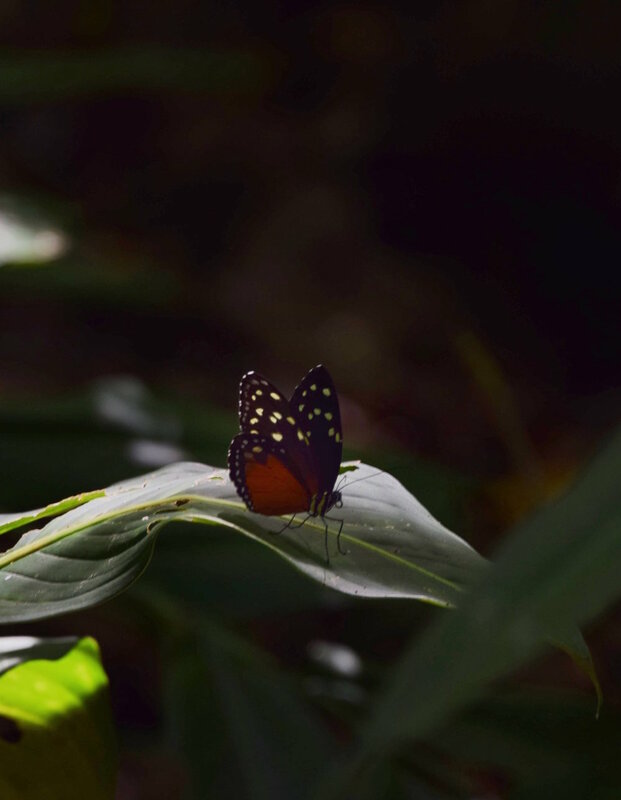 They pride themselves in being sustainable through solar energy, rainwater and highly conscious of conserving the natural beauty that is Costa Rica. Monday morning, I woke up bright and early and boarded my 6 am flight to Costa Rica. After a brief layover in Atlanta, I touched down in Juan Santamaria international airport (the biggest airport in Costa Rica – located in the capital, San Jose) around 1 pm. After a long customs line and a short car rental line, I was on my way to the pacific coast – specifically the town of Ojochal in Costa Ballena. Side note...I didn’t spend any time in San Jose because I had heard it wasn’t all that impressive. Plus I had come here for nature, beaches, and wildlife. I don’t regret skipping out on San Jose but I do plan to come back and see it next time. The drive to Ojochal was easy and straightforward. Thank god for technology, I was able to us Waze on my entire trip. Seriously how did people navigate (and live) before apps? The app easily directed me out of San Jose and onto the highway that follows the coast; Route 34. I reached Ojochal, and my first hotel, El Castillo right as the sun was setting. I ran inside and luckily didn’t have to go far to take in the amazing sunset. The small hotel sits on a cliff overlooking the beach. The sunset was in perfect view even if I only got to enjoy the last 10 minutes of it. As I checked into the hotel I received a welcome drink and started to get really excited about this 10 day Costa Rica trip. My 4-hour drive coming in gave me glimpses of a country I knew I would most likely fall in love with. (that definitely turned out to be true) Endless beaches, mountains/jungles not far away and cataratas (waterfalls) everywhere. I finished the night with a delicious meal at Azul, the in-house restaurant at El Castillo. I retired to my room, a spacious suite, and set my alarm for 6 AM. I didn’t want to miss my first sunrise in Costa Rica. I shouldn’t have worried about missing sunrise, as I would soon learn Costa Rica has its own alarm clock. Around 5:30 am the monkeys start howling and the birds start singing. I woke up and in the window directly across from my bed was a toucan, sitting in the tree closest to the window, singing away! I couldn’t believe my luck – day one and I had already spotted a toucan up close! I spend the morning enjoying the infinity pool at El Castillo and downing a typical breakfast of eggs, rice, beans and fruit. Oh and lots of coffee. I still wasn’t quite used to waking up at 5 AM. Once I had enough of the pool (which was quick because I can’t sit still for long) I headed out for my first national park. 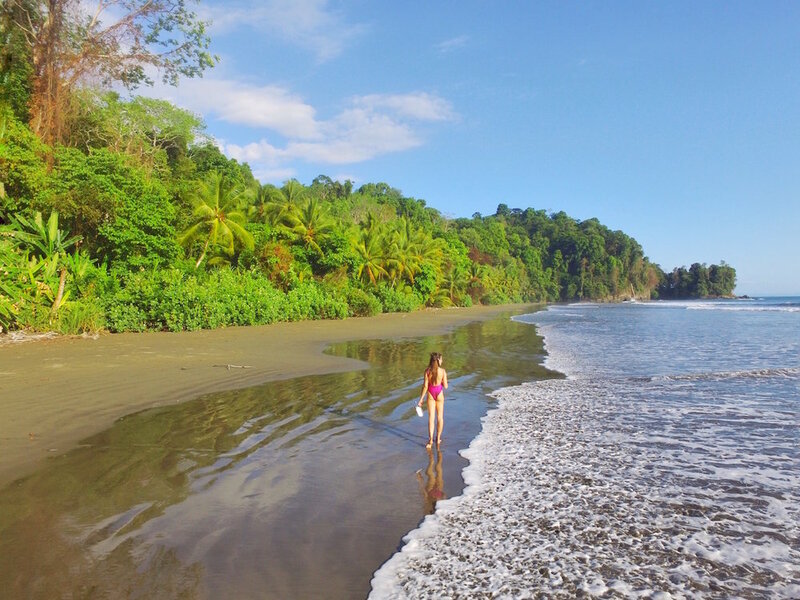 Marino Ballena National Park is one of only two protected marine oceans in Costa Rica. The park has a peculiar tide pattern that helped form rocks and beach that looks like a perfect whales tail. It only shows up at low tide and I timed it just right so I could see it. I also wanted to fly my drone over it and they are probably some of my most favorite shots I’ve ever captured. I spent most of the day in the park, walking the whales tail and then exploring the jungle that meets at the coastline. I’m glad I packed sunscreen because the sun was strong and it was HOT. I’m from Miami and even I felt like I was melting. As the day ended I headed to my next hotel, La Cusinga. Check in was a breeze and after quickly dropping my bags off in my cabin I headed to their private beach. The hike there was about 15 minutes through the jungle and then down a ton of stairs. But it was all worth it to spend so much time hanging out completely alone on the beach. The waves were strong here and I didn’t go out too far in the water. I am not a strong swimmer even though I grew up in Miami...strange right? I hiked back to my cabin as dusk was approaching and the jungle was literally alive with sounds. The insect noises were by far the loudest but I could also hear howler monkeys screaming to each other and birds getting their last meals before bed time. I enjoyed the sunset (and wifi) at the lookout lodge and ate dinner on the property. By 9 pm I was falling asleep and decided I would call it an early night and wake up again for sunrise. The next morning I spent all of sunrise (trying) bird watching. I learned quickly I am completely awful at it! Thankfully, I made friends with a fellow guest (Bob) at the hotel and he pointed birds and animals out left and right. Later that morning I learned that Bob is actually a tour organizer and was leading a group of photographers across Costa Rica. Over breakfast, I met his group of 7 travelers and they invited me on their morning walk through La Cusinga's private trails. I, of course, jumped at the chance and Bob even offered me a fancy high-powered lens to attach to my simple Nikon. The walk with them was fantastic and I saw more birds and animals that I would have ever seen if I had been alone. Plus I got some amazing shots thanks to his lens. This is one of the reasons I love traveling alone. I meet so many more people and make more connections when it is just me traveling. If you are looking for an amazing photography tour Bob does tours all over the world you can find out more here. After the morning walk, I grabbed some lunch and headed back out to the rock beach that is attached to La Cusinga's property. The rocks were so incredibly hot and the ocean waves were strong but it was a beautiful beach and a nice spot to relax. I flew my drone over the water and my heart was racing! But the shots were worth it - completely unreal. After the rock beach, I cooled off in the natural swimming hole that is also on the property. La Cusinga had so many hiking trails it was pretty awesome to have so much to do without ever having to leave the property. That night I ate some dinner and promised myself to wake up for sunrise every morning. Costa Rica has so much to do during the daylight hours I really wanted to make the most of my time. Plus it wasn’t just luck that I met an amazing photographer, it was also because of how early I awoke! Day 3’s sunrise was just as beautiful as the rest and made even more memorable by a pair of toucans singing to each other on a tree near the lookout lodge. I ate some breakfast and eventually made my way over to Alturas Animal Sanctuary, a rescue, and rehabilitation non-profit in Uvita. I had the pleasure of meeting Tom, the owner, and founder of the organization and talking with a ton of his staff about the amazing things they are doing for animals in Costa Rica. I have a bleeding heart when it comes to animals and get so upset seeing any of them hurt. I had the chance to meet a week old sloth that had a renal disorder. They told me it was probably not going to make it and I almost started crying. It seriously breaks my heart to see animals suffering. While I love all that Costa Rica has done to protect their environment and develop eco-tourism it does of course, play a destructive part. I could go on and on about my time at the sanctuary but I highly encourage you to read my full thoughts here and visit (or voulenteer!) Alturas if you ever go to Costa Rica. After my time at the sanctuary, I grabbed my bags from La Cusinga and took a cab to Oxygen Jungle Villas. Since I had rented a standard (not 4 wheel drive) car I couldn’t drive myself to my next hotel. The cab was completely worth the added expense because Oxygen was amazing!! The hotel rooms are all encased in glass and I felt like I was living like a princess. My only complaint (and it is hardly a complaint) was that since it was such a couple-y hotel I missed Matt desperately. This is definitely a place I would go on a honeymoon or anniversary trip. When I arrived the general manager, Jorge, greeted me and invited me to hike the waterfalls with him while he told me about the property. The waterfalls were amazing and like La Cusinga, I love that you didn’t even have to leave the property to visit gorgeous nature! I spent the rest of the afternoon happily lounging in my room and by the pool while catching up on work.